The first authenticated sightings were in 1928. The first White Lion sighting by a European was in the Peru area of Timbavati in the early 1940s by Joyce Mostert, whose family owned large tracks of land in the area. During March 1959, twelve lions with 2 white cubs were seen near Tshokwane in the Kruger Park; though unfortunately they were never seen again. David Alderton's "Wild Cats Of The World" claimed there were albino lion cubs in Kruger in 1960, but they were more likely to have been white lions. In 1974, a light grey lion cub was born at Birmingham Zoo, Alabama, but was darker than the Timbavati white lions reported a year later. No truly white lions were captured until 1975 when a litter containing 2 white cubs was found at Timbavati Game Reserve, adjacent to Kruger National Park. The white cubs were discovered by researcher Chris McBride. Their story is documented in the book "The White Lions of Timbavati". The 2 cubs were a male and a female that they named Temba (Zulu for "hope") and Tombi ("girl"). Their tawny brother was called Vela ('surprise') and sired a litter before being sold by Pretoria. Mcbride realised that the white cubs were disadvantaged in the wild - they were highly visible to both prey and to predators. Temba, being a male, would eventually be ejected from the pride and become nomadic until he managed to take over another pride. As a nomad, the highly visible Temba would have little chance of catching prey and would most likely starve. Tombi was safer, since lionesses remain with the pride, but would be at risk if she was ejected for any reason. More than once, the white cubs were found in an emaciated condition and the researchers found it necessary to provide kills for them.. In 1976 a white female cub was born among a large litter north-west of Tshokwane; at about 2 years old her colour darkened considerably. In 1977, an aerial census of the Central District observed a white male lion approximate 2 years old and yellow-white rather than pure white. By the age of 4, this lion (which had formed an alliance with 2 other adult males) was also darker, but its tail tip remained buff rather than becoming black. In August 1976, a white female cub was sighted in another subgroup of the pride and belonging to a different lioness. She was named Phuma (meaning "to be out of the ordinary"). She was part of a large litter that displayed a gradation of colour ranging from pure white, through pale blond to normal tawny. At the age of about 2 years, this female left the Timbavati reserve and was unfortunately killed. Her skin was later found for sale in a shop in the town of Sabi. This prompted concerns that Temba and Tombi would meet the same fate. As a result, McBride decided to capture Temba, Tombi and Vela (although tawny, Vela carried the gene for white). The cubs were taken to the National Zoo in Pretoria, South Africa where Temba produced several cubs before his death in 1996. In 1981, The white female produced a pure white cub which unfortunately died shortly after birth. Vela was sold and went to an unknown destination. 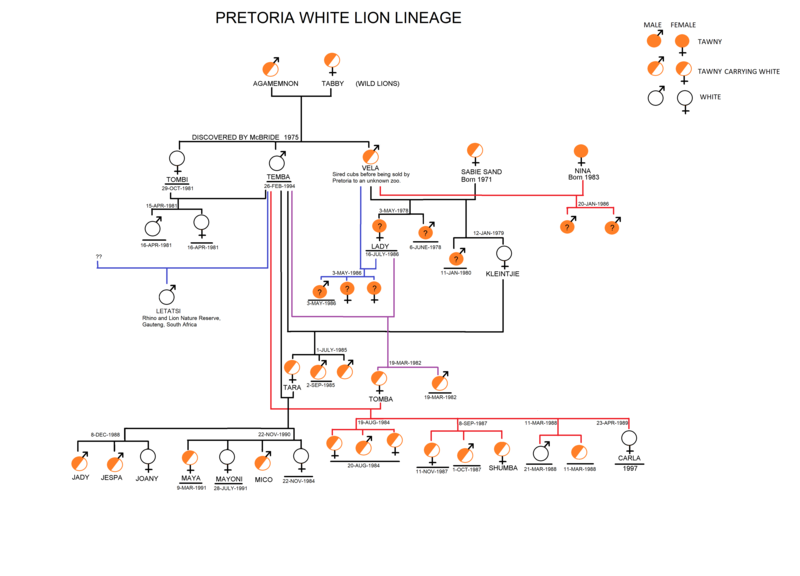 It is not known whether Vela left any descendants, though the white lions in the Ouwehands Dierenpark (Netherlands) and a private South African Zoo appear to be from the Temba a Vela lines. Since the removal of Temba, Tombi and Vela, only a few white or pale cubs were born from time to time. One female lived for several years and was often seen hunting with her pride; she was killed in a territorial fight in 1993 and no white lions have survived since then. Many people believe the cubs should have been left to take their chances in the wild. The genes to produce white in lions are now believed lost in the general population. White lions were never seen anywhere other than Timbavati Game Reserve and the white gene pool was almost definitely limited to this area. Lions in Timbavati have been killed by poachers. Several lions survived from the original white lions of Timbavati and are descended from Temba. A heterozygous tawny lion at Pretoria carries the gene for white and could pass this on to his offspring. Two heterozygous tawny males were kept at Cincinnati Zoo and are now at a private reserve in Africa. A white female and a heterozygous tawny male are at the Zoological Animal Reproduction Center in Indiana, USA. A second female from the original strain was unfortunately she was killed by the other female while on loan to a zoo. There is more than one genetic strain of white lion. In 1977, Johannesburg Zoo caught a heterozygous male apparently from a different pride to that studied by Chris McBride. This wild tawny male came from litter that contained a white lion. Johannesburg Zoo claims to be the first in the world to have bred white lions in captivity. Timba, a brown lion from the Timbavati game reserve, was shot and was taken to the zoo for medical treatment. He was believed to have the rare white gene and was bred to a captive female and later mated to one of his own daughters. His white daughter Bella was born in 1982 (along with tawny littermate Danie) and she went on to produce many other white lion cubs. 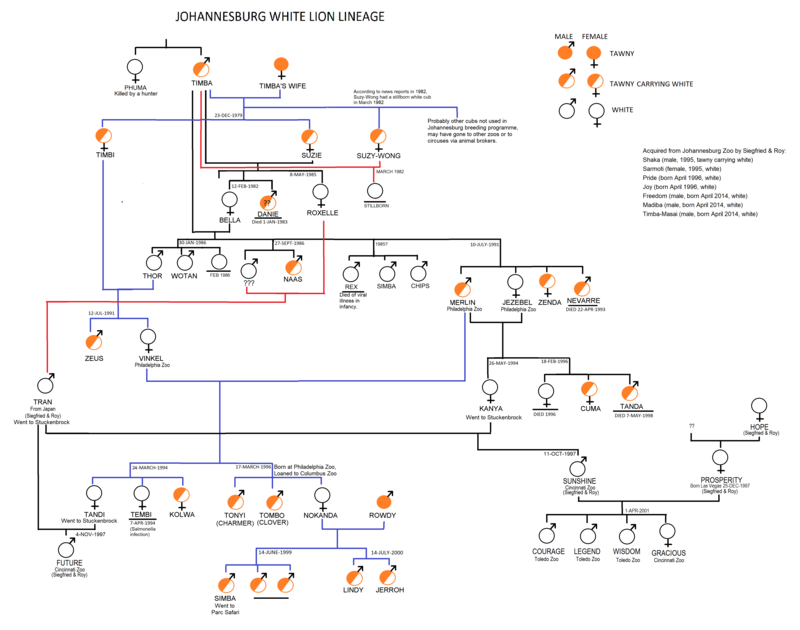 The lion that founded the Pretoria Zoo bloodline was known to have a white sibling in the wild and was therefore a carrier of the white gene. When mated with his own daughters, white offspring were produced. This bloodline is represented at zoos in Philadelphia, Toronto, China, Germany and Japan. In 1979, three different litters containing white lions were recorded in the huge Kruger National Park. In March 1979 a female lion with 3 white cubs was observed neat Tshokwane. In September 1979 another 3 white cubs (from 2 different lionesses) was seen. In 1979, the most recent litter of white cubs, all female, in the Kruger National Park were seen to have sarcoptic mange and were captured for treatment. In 1979, a white lion was observed in the Umfolozi Game Reserve in Zululand. In 2010, two white lion cubs were reported in Ingwelala, adjacent to the Kruger National Park. They were born to a tawny lioness, demonstrating the gene still survives in the wild. Unfortunately both cubs disappeared. Conservationist Dr Gaston Savoi, Co-Chairman of Mantis Collection, aims to return the white lion to the wild (although they are really a mutant strain perpetuated in captivity by humans, just like white tigers). In 2003, white lion "Jabulani" and white lioness "Queen" were purchased and released into Sanbona Wildlife Reserve, South Africa. In May 2004, this pair produced 3 cubs (2 males, 1 female). In June 2004, a white lioness and her 3 five month old cubs joined them at Sanbona. The Global White Lion Protection Trust saved these animals from a life in captivity. These lions have made their own kills in addtion to receiving carcasses of zebra and kudu. 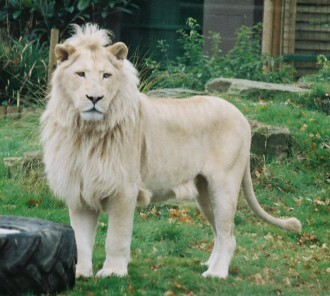 White lions are not albino (unpigmented) but are leucistic - leucism describes an effect rather than a particular gene. They have pigmentation which is visible in the eyes, paw pads and lips. Their eyes are usually the normal hazel or golden colour although some have blue, blue-green or greyish-green eyes. At birth, the cubs are snowy white and may be described as resembling polar bear cubs. The birth colour gradually darkens to a pale cream colour known as blond (another name for white lions is blond lions). The mane and tail tuft remain a paler shade. In the Long Island ocelot Club newsletter 23/2 April 1979, Pat Warren wrote "The Color Genetics of Hybrids" based on her F1 Geoffroy's Cat hybrids and F1 Leopard Cat hybrid. Warren considered the cream coloured "white lions" of Timbavati might be the recessive cream dilute of a red colour familiar to domestic cat breeders. In 2008, it was suggested that some very pale captive lions had a gene analogous to "champagne" in horses. Although the mutation occurred naturally in the wild and has cropped up several times due to hidden recessive genes, white lions do not have a place in the wild. They lack the tawny camouflage needed for survival - this makes them visible to poachers and to the prey, reducing their effectiveness as predators. It is possible that the former range of lions may have included terrain where a blond colour was advantageous. Modern strains of white lions should be considered "man-made" much as a Persian cat is a man-made cat breed. There has been a recent trend in breeding pure white lions for zoo exhibits and animal acts. To ensure genetic diversity, they are crossed with tawny lions from the same region. Skin and fur get their colour because the tyrosinase protein helps skin cells manufacture melanin. A genetic defect in tyrosinase leads to albinism because melanin cannot be made - either cannot be made at all, or cannot be made properly. This is "c-locus albinism" and it also affects the visual pathways, sometimes resulting in crossed eyes because the nerves from the eyes connect up in an abnormal way. In domestic cats, there are several albino mutations: Burmese sepia (changes black to brown, orange to yellow), Siamese colourpoint (colour is restricted to head/legs/tail), blue-eyed albino and pink-eyed albino. There is also the "Inhibitor" (Chinchilla) gene that prevents deposition of pigment on the hair shaft, but allows pigment at the hair tips - this is the mutation found in white Bengal tigers. The normal colour of lions varies from sandy-golden through to tawny-brown with the male's mane being dark brown or black in some subspecies. Faded spots and rosettes may be visible under some lighting conditions. According to Roy Robinson, noted feline geneticist, white lions have either the chinchilla or acromelanism mutation. Some older literature mistakenly referred to chinchilla as a form of albino. 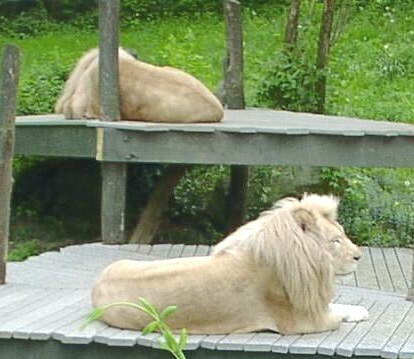 The appearance of blond and white lions (colloquially called leucism) means that colour variations in lions are probably more common than originally thought. The high mortality rate in lion cubs means that those colour variations haven't been observed in the past. White lions have survived due to human intervention. Though not as common as white tigers, white lions are now being found in more and more zoos and may well be the current "must have" big cat. Their value as attractions may well send them down the same path as the white Bengal tiger: mass production, inbreeding and indiscriminate crossing with other subspecies e.g. to produce larger, showier manes for circus acts. Already they have been bred in bulk with no regard for health and used in canned hunts. If crossed with stripeless white tigresses, white or blond ligers would result - something almost certain to happen one day because the huge size of ligers makes them attractive exhibits.